This executable test suite (ETS) verifies that a WFS 2.0 implementation conforms to OGC 09-025r2/ISO 19142 (Geographic information -- Web feature service) and related standards as depicted in Figure 1. Conformance testing is a kind of "black box" testing that examines externally visible characteristics or behaviors of the SUT and is independent of any implementation details. Implements the following operations: GetCapabilities, DescribeFeatureType, ListStoredQueries, DescribeStoredQueries, and the GetFeature operation with at least the StoredQuery action (GetFeatureById). As for Simple WFS, plus the GetFeature operation with the Query action and the GetPropertyValue operation. As for Basic WFS, plus the Transaction operation. As for Transactional WFS, plus at least one of the GetFeatureWithLock or LockFeature operations. 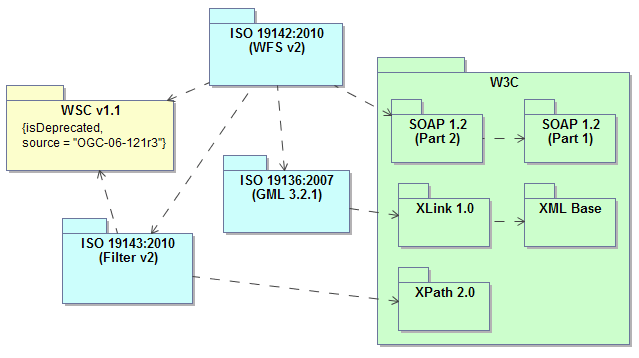 The GML application schema meets the requirements of the GML conformance class "GML application schemas defining features and feature collections" (ISO 19136, A.1.4). Data are available for at least one feature type advertised in the capabilities document. A feature identifier may be supplied for the purpose of verifying the behavior of the GetFeatureById stored query. This identifier is required to test a "Simple WFS" implementation but is ignored if the WFS under test implements the "Basic WFS" conformance class. The test suite definition file (testng.xml) is located in the root package, org.opengis.cite.iso19142. A conformance class corresponds to a <test> element; each test element includes a set of test classes that contain the actual test methods. The general structure of the test suite is shown in Table 1. Note that some schema-related tests are imported from the GML 3.2 test suite. The Javadoc documentation provides more detailed information about the test methods that constitute the suite. Integrated development environment (IDE): The main Java class is org.opengis.cite.iso19142.TestNGController. REST API: Submit a request that includes the necessary arguments to the test run controller (/rest/suites/wfs20/1.26/run). TEAM Engine: Run the CTL script located in the /src/main/ctl/ directory. The test run arguments are summarized in Table 2. The Obligation descriptor can have the following values: M (mandatory), O (optional), or C (conditional). wfs URI M A URI that refers to a representation of the service capabilities document. This document does not need to be obtained from the service under test (SUT), but it must describe the SUT. Ampersand ('&') characters appearing within a query parameter value must be percent-encoded as %26. fid NCName O An identifier that matches the @gml:id attribute value of an available feature instance (may be omitted for "Basic WFS" implementations). Note: A test method is skipped if any preconditions were not satisfied. Test prerequisites are usually checked in a configuration method; the results of these can be viewed in the TestNG report by selecting the "Config" check box. Which tests are actually run is determined by the content of the WFS capabilities document; in particular, the conformance classes that the implementation claims to support. There is a service constraint defined for each conformance class, except for the mandatory "Simple WFS" conformance class (see ISO 19142, Table 13). The boolean-valued service constraints are listed in the OperationsMetadata section of the capabilities document as shown below.